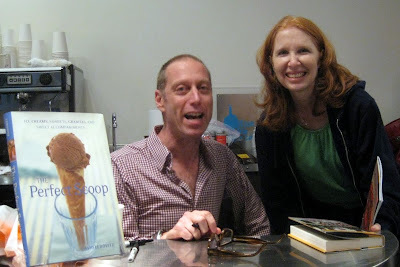 My Mom Met David Lebovitz, or OMGWTFBBQ! You may have noticed if you've been following this blog that I am a big fan of David Lebovitz. I've made a bunch of his recipes, including this, this, this, and this. I read his blog. And I follow him on Twitter. You should, too. So it should come as no surprise that when my mom met the man/pastry genius on Thursday at a talk/book signing hosted by Charles Chocolates in Emeryville, CA, I was jealous. And that was before I saw the above photo. Now I'm just....beside myself! David, if you're listening, come down to LA so I can shake your hand, or serve you some Maple Walnut Ice Cream from your cookbook. Last time I made it, it was the hit of my dessert party.